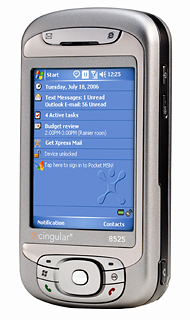 Cingular 8525 is a Windows Mobile Pocket PC and also the first UMTS/HSDPA-enabled PDA Pocket PC in North America. Cingular 8525 Pocket PC Phone is powered by Windows Mobile 5.0 with with Messaging and Security Feature Pack and Direct Push Technology, and features tri-band UMTS/HSDPA, quad-band GSM/GPRS/EDGE, 128MB ROM / 64MB SDRAM, sliding QWERTY keyboard, 2.8″ QVGA 320×240 64K color LCD touch screen, Push to Talk capable, Bluetooth v2.0, integrated WiFi (802.11b/g), infrared, Micro SD expansion slot, Pocket MSN with Hotmail, MSN Messenger support, optional 2.0 mega-pixel camera with built-in flash and video capability and optional TeleNav GPS Navigator. PC Magazine picks Cingular 8525 as editors’ choice with very good rating of 4 out of 5 and comments that Cingular 8525 will keep you connected to the Internet at the highest speed possible wherever you go (given the limitations of Cingular’s network), and you won’t miss a single call while you’re online. Good for HSDPA and Wi-Fi for high-speed Internet, zippy Samsung processor and stereo Bluetooth, but it comes with not the greatest keyboard, earpiece could be louder and some hiss on calls. CNet reviews Cingular 8525 and concludes with excellent rating of 8 out of 10 that the Cingular 8525 is the first UMTS/HSDPA smart phone to be offered in the United States. It has integrated Bluetooth 2.0, Wi-Fi, and supports Cingular’s new location-based services. The Windows Mobile device also has push e-mail capabilities, a 2-megapixel camera, a spacious QWERTY keyboard, and good call quality. However, the Cingular 8525 is on the heavier side and the navigation array is a bit cramped. The smart phone is also pricey. For the ultimate road warrior, the 3G-enabled Cingular 8525 provides the speed, the power, and the productivity tools to get your work done on the go. MobileTechReview reviews HTC TyTN (nearly identical with Cingular 8525, both of code name HTC Hermes variants) and concludes that it’s an excellent device for power users who need to do email, view and edit Word and Excel documents, view PowerPoint presentations and PDFs on the go and surf the web. Not just a business device, the Cingular 8525 and TyTN are great multimedia playmates with good support for music and video playback. Compared to their MS Smartphone counterparts they’re more easily customizable and there’s a great selection of 3rd party software to extend both business and pleasure use. As the first 3G PDA phone and smartphone announced in the US, the 8525 has special appeal to those who use the web and email heavily, assuming you’re in a 3G coverage area. The faster processor, HSDPA 3G radio, better camera and Bluetooth 2.0 make it a worthy successor to the Cingular 8125 and company, though only you can decide if the price difference is worth it. If you’re a heavy PDA user, the 8525 wins. If you prefer a one-handed phone centric device, the Palm Treo 750v 3G Windows Mobile Pocket PC phone may be worth the wait. Laptop Magazine (dead link) gives 4 out of 5 rating to Cingular 8525 PDA and concludes that at $399, the 8525 is considerably more expensive than other Cingular smart phones, such as the Nokia E62 ($149 with rebate) and the Treo 600 or 8125 (both $249). Still, the faster HSDPA connection—when you’re within coverage—large keyboard and display, flexible Bluetooth profiles, and more robust software make the 8525 a top-flight PDA phone.